Pelmeni (пельмени in Russian, singular pelmen, пельмень; пяльмені in Belarusian) are a traditional Eastern European (mainly Russian) dish usually made with minced meat filling, wrapped in thin dough (made out of flour and eggs, sometimes with milk or water added). For filling, pork, lamb, beef, or any other kind of meat can be used; mixing several kinds is popular. The traditional Ural recipe requires the filling be made with 45% of beef, 35% of lamb, and 20% of pork. Traditionally, various spices, such as pepper, onions, and garlic, are mixed into the filling. Russians seem to have learned to make pelmeni from Finnic and Tatar peoples of the Taiga, the Urals and Siberia. The word means "ear-shaped bread" in Finnic languages such as Udmurt and Komi. In Siberia they were made in large quantities and stored safely frozen outside for several winter months. By the late 19th century, they became a staple throughout urban European Russia. They are prepared immediately before eating by boiling in water until they float, and then 2–5 minutes more. The resulting dish is served with butter and/or sour cream (mustard, horseradish, and vinegar are popular as well). 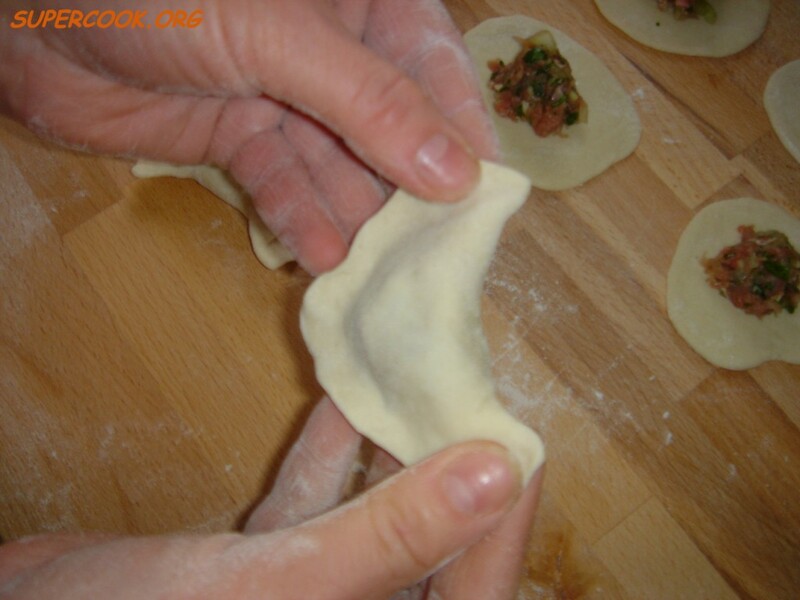 Some recipes suggest frying pelmeni after boiling until they turn golden brown. 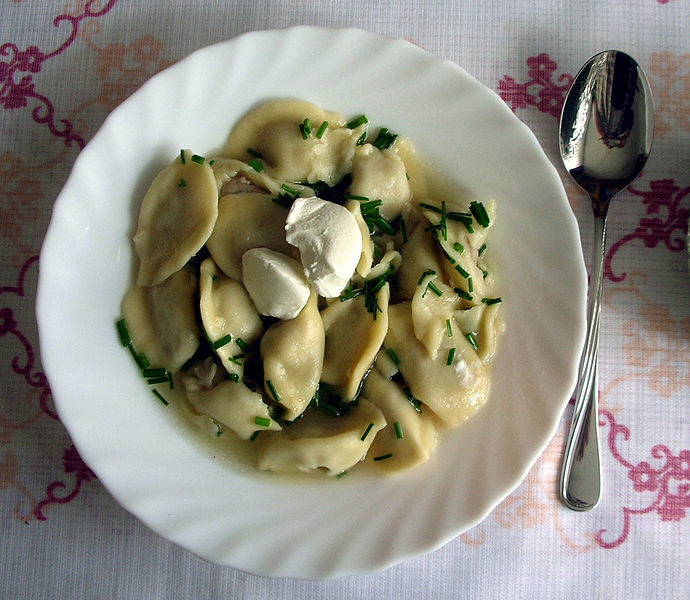 Pelmeni were particularly favored by hunters, who were looking for light, easy-to-prepare, nourishing food to take with them frozen on long hunting trips in the winter. Pelmeni belong to the family of dumplings. Akin to vareniki: Ukrainian variety of dumplings with filling made of mashed potatoes, farmer's cheese, or cherries, to mention the most popular three. They are not dissimilar to Chinese potstickers, Tibetan mo-mo and Italian ravioli. The main difference between pelmeni and other kinds of dumplings is in their shape and size—typical pelmen' is roughly spherical and is about 2 to 3 cm in diameter, whereas most other types of dumplings are usually elongated and much larger.